KILDARE’S Lauren Kelly is in Hungary this week hoping to add a World Championship medal to her three European bronze. Kelly brought a bronze home from Bulgaria in the Europeans last April and is hoping to at least match that achievement. “This is my last Worlds as a youth so looking forward to it and hoping to make it a good one. I took the European medal and was happy with that but I took the loss and worked on that more than anything. I was in a sparring camp last week so I met four or five of the girls that will be in my weight at the Worlds so it was good to get a go at them before we get over that,” said Kelly, who is captain of the Irish girls team. At this stage, Kelly is well acquainted with the other boxers in her 75kg category so she knows what to expect and there is one stand out favourites. “I’d know all the girls in my weight at this stage. They’ve been there for the last two years or so as we’ve been moving up. My main opponent would be Anastasia Shamonova from Russia. She has only ever been beaten twice, she is four time European and two time World champion. She is the favourite of the whole competition, she beat me in the Europeans two years ago,” said Kelly. “I’m well used to trips like this now so I have my routine well sorted out at this stage. I competed in the Worlds last year but didn’t get a medal so I’d like to change that now and bring home a world medal,” she added. 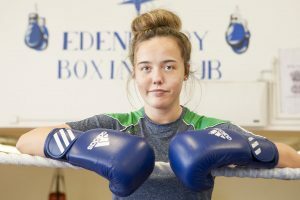 Although she travelled out to Hungary last weekend, Kelly won’t actually be in action until Sunday 26 August when she takes on the French boxer, Tallya Brillaux. Kelly is two wins away from a medal. “I won’t fight my first fight until 26 August so I’ll be out there for a good while without a fight but that just gives me more time to acclimatise. My first Europeans were in Hungary so it will be nice to go back there,” said Kelly. She has been training hard in the build up to the competition. “I’m happy with the camp and I’ve been in another camp in Abbotstown for the last five weeks. We were up there all last week until Friday and then left on Saturday morning,” she said. Kelly is also thankful to her coach at the Edenderry club, Liam Brereton, for all his help in her preparations. “I’d be lost without Liam, he is the one who does all the work behind the scenes. He brought me to Spain because after the Europeans the Worlds came fairly quick so to get my fitness back up quickly he brought me to Spain and working in the heat helped me get that fitness back quickly with less work,” she said. As well as looking at the World Championships, Kelly also has one eye on the Youth Olympic Games in Buenos Aires, Argentina at the start of October. “I’ve been dreaming about that for about three or four years, since it was introduced really,” she said, and admitted that it was a bit of a shock to be the only female Irish boxer to qualify. “I thought there was a chance but the first qualifier was the Worlds last year and Russian qualified after winning gold. She won the gold again at the Europeans just gone and because she had a place already, her place was went to the silver medallist. As far as I know, the reason I got the place was because America didn’t have a girl at 75kg. I was the first reserve and got that spot,” said Kelly. A busy, but potentially hugely rewarding, couple of months ahead for the very talented Rathangan boxer.